No Need To Fly To Sri Lanka Repeatedly Because Ministry Of Crab Is FINALLY Coming To India! Oh yes, it is. And we cannot be more excited. Although it is a slight let down that it’s going to be in Mumbai. Still, at least you don’t need a visa to load up on some divine garlic butter crab at The Dutch Hospital. 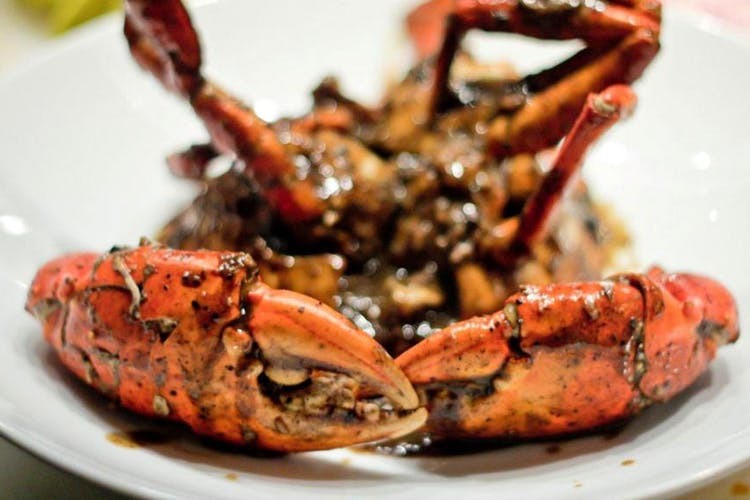 The brainchild of cricketers Mahela Jayawardene and Kumar Sangakkara, and restaurateur Dharshan Munidase, Ministry Of Crab is all about being crabby. They originally set out to highlight the lovely seafood of the country, and zoned in on the massive, juicy crabs one gets here. Oh, plus jumbo prawns. Hopefully, all of this, and more is going to be at the Mumbai branch too. We’re also hoping they will keep the same format as they do in Colombo. This means tucking into food with a bright orange bib tied around your neck because they believe in really getting your hands dirty and enjoying every bit of the meat. If the original is anything to go by, you’ll soon be picking the size of crab — from a half kilo one for a small eater to the Crabzilla option that is about 2 kilos and more. Pepper, chilli and curry versions are typical to Sri Lanka, though the garlic butter option is a hot favourite too. Maybe they’ll even do an Indian version. Either way, we’re booking our tickets to Mumbai for every month, just for our fill of this! Check out our love for the Colombo restaurant here.